The all local line-up brings great Tasmanian talent to life. Headlining will be Hobart’s, Chupacabra the 8-piece band play with horns, accordion, guitar and bass, their latin percussion and Spanglish together give you great rhythms. Adding to the big band feel will be Hobart swing/jive band, Uncle Gus and the Rimshots, who have infused their youthful energy into a traditionally older musician's scene. Fresh from playing at Falls Music and Arts Festival, The Surreal Estate Agents will add their mixture of folk/funk/rock to the afternoon. DynOmite Drew will bring in the afternoon on the wheels of steel, with a selection of laid back reggae and calypso. Complementing the relaxed surroundings of the gardens will be Karly Fisher adding her acoustic vibes. The event will kick-off at 2pm. Kids under 8 are free. 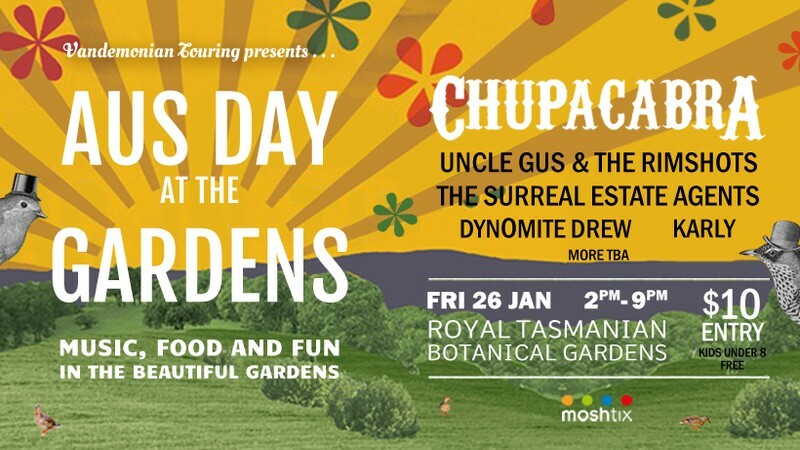 The Aus Day at the Gardens Event will produce an afternoon and evening of quality entertainment coupled with fine food, great local talent and an array of drink choices to help you celebrate the prominent Australia Day.